Improvements and additions are made to our outdoor education center continuously throughout the year. We have provided seating for the students and teachers by placing cut logs from fallen trees in our garden area. Each Spring we work as a school community to plant native shrubs, a vegetable garden full of tomatoes, cucumbers and herbs. We place signage on all of our plants for continued learning opportunities for ourselves and other community members. In our outdoor learning center we have a greenhouse. We use our greenhouse with our seedlings to provide them with an adequate environment to begin to sprout. Our outdoor tumbling composter is in our outdoor learning area. Each day the students place their fruit and vegetable scraps from lunch and snack into the composter. We use the created compost when we plant in Spring. In 2016, we added musical pieces to our outdoor learning center and a balance beam. We are able to hear the beautiful music created by our students in the garden, all the way in the school building! We have numerous natural building materials in our outdoor learning center, including bricks, shells, and wood pieces. For students to explore their surroundings we have magnifying glasses, bug catchers, mirrors, tracking books, and binoculars available to use. 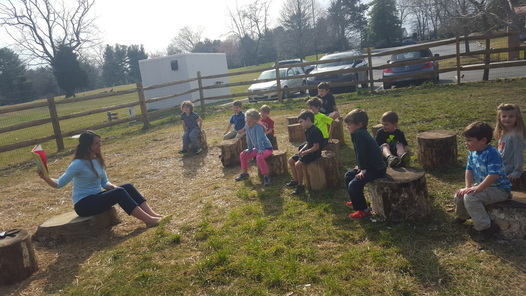 The students have numerous opportunities to play in and interact with this space each day, and those opportunities will increase with the continued expansion of our outdoor learning center. On June 8, 2016, the students took an extra step in preserving their outdoor facilities: they organized their own clean up of the school grounds, spending the day outside after school to make their outside environment as clean as possible. The clean up was suggested by one of our kindergarten students and involved the entire SMDS community--parents, students, and teachers. The student's enthusiasm for the project is a great sign of how our environmental curriculum is making an early difference in how they look at their environment. Each year, we have a student led campus clean up in the Spring. In addition to decorating our own rain barrels for our school, our students have also helped to decorate our playground and outdoor education center. Some of that artwork, including native wildlife and flowers, can be seen along the fence. Each year our Kindergarten class adds an additional piece to our outdoor learning center. They have made stepping stones, and various planters in the past. 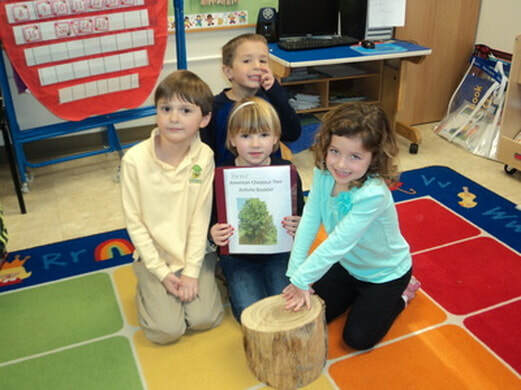 Each year, our Kindergarten Class studies native trees in an in-depth Tree Unit. They learn about the different types of trees, draw diagrams, take field trips outside to our school grounds to collect specimens, and make arts projects revolving around the tree unit. This is a hands-on unit that occurs as much outdoors as indoors. The students learn about the different types of trees, why leaves change color, and how trees benefit us in many ways. Students learn to measure trees, and the importance that trees play in our environment.